This new Geronimo Stilton series spin-off is set in the Stone Age! Who is Geronimo Stiltonoot? 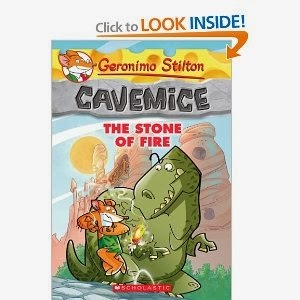 He is a cavemouse Geronimo Stilton's ancient ancestor. He runs the stone newspaper in the prehistoric village of Old Mouse City. From dealing with dinosaurs to dodging meteorIt's, his life in the Stone Age is full of adventure! The Stone of Fire - Old Mouse City is in an uproar. The most precious artifact in the mouseum the Stone of Fire has been stolen! Geronimo Stiltonoot and his cavemouse friend Hercule Poirat are on the case. It's up to them to retrieve the stone from the ferocious Tiger Khan and his band of fearsome felines!